The USB-4761 is a relay actuator and isolated D/I module for USB bus. It provides 8 optically-isolated digital inputs with isolation protection of 2500 Vdc for collecting digital inputs in noisy environments and 8 relay actuators for serving as on/off control devices or small power switches. For easy monitoring, each relay is equipped with one red LED to show its on/off status. The USB-4761’s 8 optically-isolated digital input channels are ideal for digital input in noisy environments or with floating potentials. The USB-4761 digital input channels feature a rugged isolation protection for industrial, lab and machinery automation applications. It durably withstands voltage up to 2500 Vdc, protecting your host system from any incidental harms. 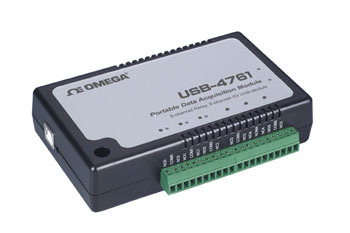 If connected to an external input source with surge-protection, the USB-4761 can offer up to a maximum of 2000 Vdc ESD (Electrostatic Discharge) protection. Data collection is simple. Simply plug the data acquisition module into an available USB port and our easy-to-use Windows software does the rest. The software converts your PC into a real-time strip chart recorder. Data can be printed in graphical or tabular format. It can also be exported to a text or Microsoft Excel file.